In Clades, the sauropsids of the earth are squamates, comprising all lizards and snakes. “Squamate” means scaly, and their scales distinguish them from turtles, birds, and crocodiles. These other sauropsids have scutes, which are made of bone and horn, but they don’t have scales. The earliest modern lizards lived almost 200 million years ago and resembled geckos. That was about 50 million years after the earliest dinosaurs appeared. The common ancestor of all lizards and snakes could unhinge its jaw to swallow large prey, as can today’s squamates, especially snakes. 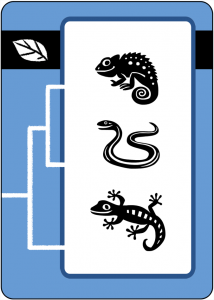 In Clades, the three squamates are a gecko, a snake, and a chameleon. Scientists propose that snakes and chameleons are together in a “venom clade” called Toxicofera. This clade also includes iguanas, gila monsters, and related lizards.